I have a lot of fabric I can cut up for scraps, I just don't a have a good eye for color when it comes to what scrappy quilt looks good with a variety of colors. Some people will make a scrappy quilt with just a few colors and some with no rhyme or reason. Dumb question of the day: Now how do you organize your scraps to know what scrappy quilt pattern to make? as with most quilting questions :1 its not dumb! and 2 its a matter of preference. Some quilters just canNOT make scrappy quilts. And thats OK! Check out Bonnie Hunter's site for tons of info, including a scrap cutting method for organizing your scraps. She is AWESOME! You might pick out a quilt from her free patterns and start cutting to fit that quilt. I am in the process of making a very scrappy string quilt. How I do it is to have a large selection of fabrics to choose from and just grab one. If i don't like it, or feel it goes with the last string, I choose another color. I have so many to choose from, it's gonna be scrappy no matter what I pick up. I guess I'm the dumb one. I thought a scrappy quilt was just that - scrappy with no rhythm or reason. Unless, of course it's a controlled scrappy, then that's a whole new ball game. I'm anxious what others are saying. Some go according to pattern like all dots, gingham checks, florals, colors, such as black and grey, black and white black any other color. Nothing but neutrals which could be, black, shades of grey, beige, brown, creams etc. Sometimes one pattern material and pull similar colors from it. It all depends on what it's for. Many piece odds and ends and use for a backing on a donated quilt. Some have left over knits, linens, cottons, just all depends on the moment an what the situation calls for. I try to keep like colors together. Blacks, browns and beiges, greens, reds, pinks,yellows, I have found if I keep according to the color wheel, I'm good. Also each color usually has 2 bins 1 1/2 to 5" scraps. Then up to 1/2 yd. Anything larger than 1/2 yd goes on a fabric board. I usually pin a note as to what is left after use. If there is 1/2 yd or less it goes into the scrap bin according to size. Never met a scrappy quilt I didn't like. When making a truly scrappy quilt I think more in terms of light, medium and dark. For a truly scrappy quilt the color is less important than the values. When its all together it is amazing how all the colors blend. Lately I want to make a scrappy with a limited amount of colors. Since my stash is sorted by colors it will be easy to pick two or three colors with maybe an occasional splash of another to give it spark. Really, you can't go wrong with scrappy. A postage stamp quilt is a good way to get a feel for how the fabrics work together. Also there have been some great scrappys on the Board using a larger pieced block among the smaller squares. If you do a search for "scrappy" there are some beautiful pictures to give you some ideas. Just a couple of thoughts, hope this gets you started. Have fun. I love the scrappy look but I have never been able to do it. I am way to ocd to be able to cope with just throwing fabric together. you're not dumb. Scrappy is made from scraps. They can have no rhyme or reason or they can have rhyme or reason. We used to make scrappy quilts all the time when I was a kid. We cut up the good parts of worn out clothes and sewed them on to squares of an old sheet that was saved for this purposed. Cleaned up the edges then sewed them all together. Used old army blankets for batting. Did not even know what batting was until I retired and started taking quilting classes! Went to the TG&Y for $1 a yard fabric for the back. Everybody loved those quilts. Can't get more scrappy than what they were. I, too love all those scrappy quilts. I haven't made one yet but plan to as soon as I get a couple more UFOs finished. I'm sure I can do it and use up a few bags of scraps...... that's the plan anyways. It looks like fun and will clear out some of the 'stuff' in the sewing area. Scrappy to me has no rhyme or reason, unless a controlled scrappy. I have accepted the fact that I can only do controlled scrappy. You are so right that some people can go totally scrappy and have it turn out great. 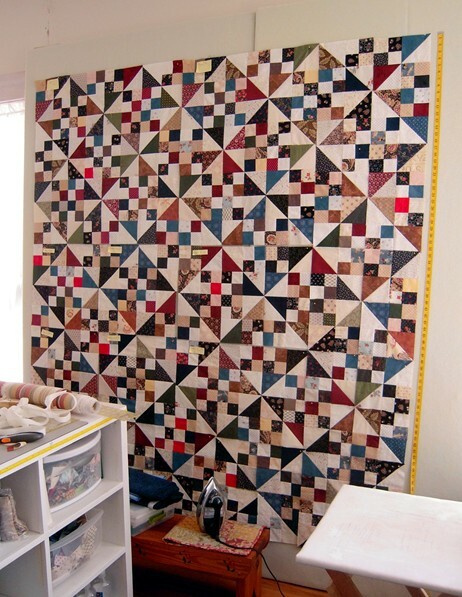 Take a look at Bonnie Hunter's scrap quilts on her www.quiltville.blogspot.com under the free pattern tab. Her quilts give you units to make scrappy and then they make a pattern. I did her Basket-weave-strings and I was pleased with it. I am not there totally ... yet. I still break down my fabrics into lights, darks, & ?mediums. Maybe one day ... ??? Check out the scrappy quilt pictures in the QUILT GALLERY here: click HERE you'll go to the Gallery's album list. Or, if you are looking for a particular type of quilt (such as scrappy), click HERE to find a list of links by category. Wow! TG&Y, and Kreskee's (not spelled right)! That's putting me in a different place. Thank you for giving me something better to think about as I clean a real mess this morning. I agree with the previous posters: "scrappy" covers a wide range of territory. I call the "throw everything together" a "kitchen sink scrappy" and in my opinion Postage Stamp or String Quilts are perfect examples. Or you can go more controlled. One method I have found very effective is the monochromatic scrappy, where I use just one main color, expressed with many different fabrics. 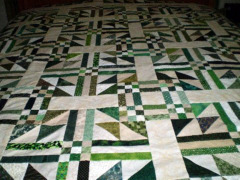 My "Green" quilt is an example of this. Another technique is to take a regular pattern but substitute certain parts of the pattern with scraps. Bonnie Hunter is a master of this; many of her quilts utilize this technique. I have a wall hanging where the flowers are single colors but the background is a collage of squares and rectangles of every cream and beige I had at the time. 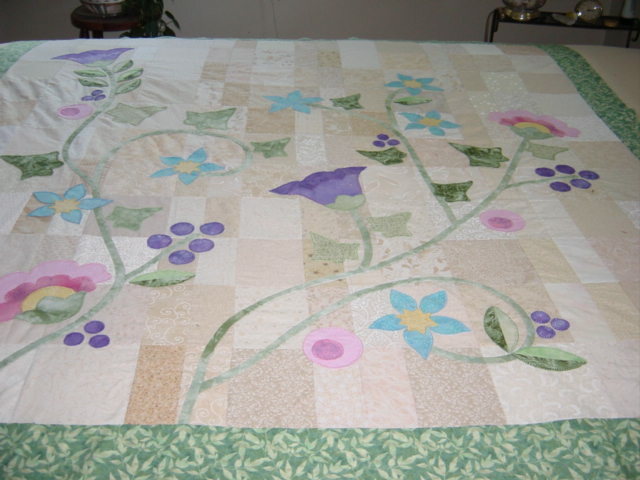 My machine quilter really brought the quilt alive by quilting dragonflies, bees and butterflies in amongst the flowers and it's one of my favorite quilts to this day. I love scrappy, but I can't just throw fabric together either. I'm better than I was, but I like some harmony. I think value is super important and some peoples failure is the fact that they can't seem to find that value balance. That said, more colors seem to go together than what I would have thought before my really scrappy days. Like reds and pinks just sort of blend as a value, and purple is a neutral to a certain extent - I have several of the eggplant purples and they go with most everything. I do my scraps in tubs of strip sizes. I have a 1 1/2" tub one in med/darks and another in lights - I love my neutrals - a 2" tub of lights that is shared with my 2 1/2" light strips, my 1 1/2" strip med/darks is huge and over flowing. When I decided to go scrappy I'd buy 1 yd of different colors and patterns - no reason, I just had to like it. Then cut a strip of 1 1/2", 2", and 2 1/2" strips from it and fold away the left overs for bigger block parts. It was an ideal situation for me. What I had was stuff from Joann's and lesser quality and I used to wash before sewing. Now I just do qsq and don't wash. I thought it better to start with really good stuff and all treated the same. My first scrappies were log cabins and I think that pattern is a great teacher for scrappy and value uses. You just eed to cut lose and have fun. Don't be silly controlled or not they are all beautiful. somtimes I just throw them in a bag, pull out whatever and make myself use it, They too are beautiful. Also if you use one color throughout it will tie it all together. Have fun with it. Enjoy the process. i LOVE scrappy quilts... but i organize my scraps to light and dark and medium if i can't decide. that way, if the pattern relies on light spaces and dark spaces, i can choose from the right bin. I've done scrappy several ways. I did a star quilt in just two colors but used 17 reds and over 30 neutrals. I did two log cabins where I sorted into light and dark and just used whatever came out of the bag. They turned out really cool and fairly masculine since I used every ugly and weird fabric I could find. I do square in a square scrap quilts for the girls where I go thru and pick each square combination. I put some together that really go together, some don't really go together but work together and some clash. Putting a few together that really clash really gives those quilts zing. For the boys I do string quilts but for them I make light blocks and dark blocks and then cut them on opposite diagonals and then put them back together. For those quilts I just made two piles of light and dark and did all of the light blocks first and just plucked strings out of the pile and then did the same with the darks. I should write a book about how to make scrap fabrics work together. I make pretty much nothing but scrappies now. Some are controlled, most are not controlled as to color but as to value (relative lightness of darkness of a fabric.) Here's an example that's on my design wall now. The only limitation on the actual colors was what I had available (quite a few repeats). I made these blocks as a lesson in the importance of value instead of color in a scrappy. This layout happens to be from a book by Lynn Roddy Brown "Simple Strategies for Scrap Quilts" but Bonnie Hunter has the same layout in a design called Patches and Pinwheels. Lynn's book has a great lesson on understanding value. In arranging the blocks, I did try to distribute the ones with reds and yellows throughout the quilt to spread around those little bright colors. As for sorting and storage...I go by size rather than color or value. When I want to make something I then sort for either color or value. Try that....ignore the color and focus on the value then pick a pattern that plays up the lights vs darks. I'm going to make my first scrappy soon. I have the same thoughts as you. I like the method I've seen of just tossing them all together and grab one! No thinking. So far the only scrappy I've done was the mystery train ride one. Being a bit of a control freak I sorted my lights, mediums and darks and then picked sets of nine that I liked together that had variety of both color and value in each set. The thing that gave it continuity was the sashing and using the same dark background multicolor print fabric for all the stars at the intersections of the sashing. I've since added borders which also help pull it together as well as increase the size. Will see if I can get a picture of it.